The Industrial Maintenance Technology program at Somerset Community College offers students a comprehensive, action-based technical education program. This program was designed to give the student the knowledge and skills needed to safely and efficiently perform the maintenance tasks that are necessary to maintain the machinery and associated equipment that are common to local industry. An understanding of the requirements and opportunities in maintenance, good safety practices, pride in workmanship, and an understanding of the principles and accepted practices of the maintenance trade are covered in this program. Students are trained to hold positions in factories, automated manufacturing facilities, energy production plants, stamping facilities, hospitals, etc., where multi-skilled maintenance personnel are needed. Included are courses in industrial electricity, motor controls, programmable logic controllers, welding, general maintenance, fluid power, metal fabrication, and machine tool. 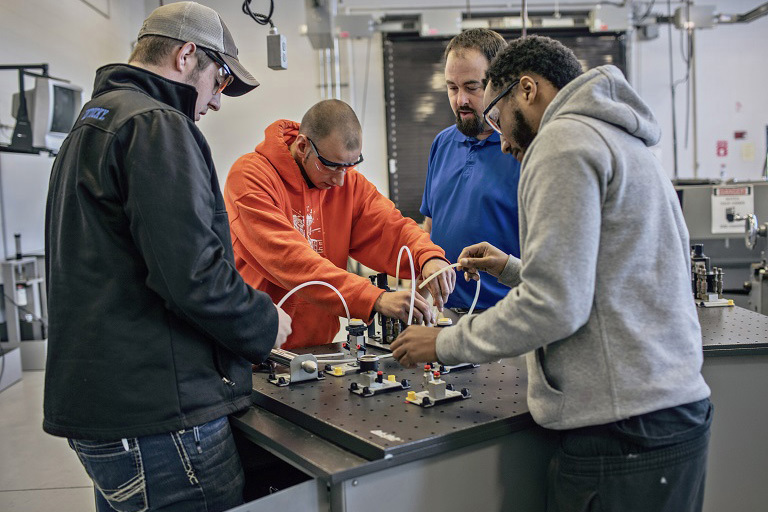 Progression in the Industrial Maintenance Technology program is contingent upon achievement of a grade of “C” or better in each technical course and maintenance of a 2.0 cumulative grade point average or better (on a 4.0 scale). The Industrial Maintenance Technology program at Somerset Community College was designed to prepare entry level multi-skilled industrial technicians wishing to pursue a career in the field of industrial manufacturing equipment maintenance, troubleshooting, and repair. Successful graduates in the program should be able to maintain and prepare production equipment in the areas of mechanical, electrical, and hydraulic systems. The program offers a 67 credit-hour Associate in Applied Science degree as well as a diploma and 8 certificate options. The program incorporates 21 credit hours in general studies, 28 credit hours in the major core of industrial maintenance and 18 hours of electives that will allow the students to acquire a broad exposure to the industrial maintenance field. The electives allow students and employers to customize a program to meet their specific needs. The electives may be taken in a broad array of classes including, but not limited to, maintenance machining, presswork and die maintenance, programmable logic controllers, and electrohydraulics. Program offered at the Somerset Campus and Laurel Campus. Please contact the program coordinator for more information. Industrial Maintenance Technology was recently listed by KCTCS in the 2010-2016 Strategic Plan as a High Wage / High Demand job! Somerset Community College now offers two credentials in the areas of Presswork and Die Maintenance. With these certificates, graduates are prepared for entry level employment as a Presswork and Die Maintenance technician in a stamping facility. Currently, SCC is the only college in Kentucky offering these credentials. Upon completion of the program, graduates are offered the opportunity to gain national certification through the AMTEC and NOCTI end of program assessments.